I’m not very good at video games. Actually, I’m fairly bad at them most of the time. Final Fantasy VII was the first game I ever actually beat, and Final Fantasy has stuck with me since then. Right now, there’s a really cool event going on in SL – The Final Fantasy Festival, which started yesterday, and will last for two weeks. 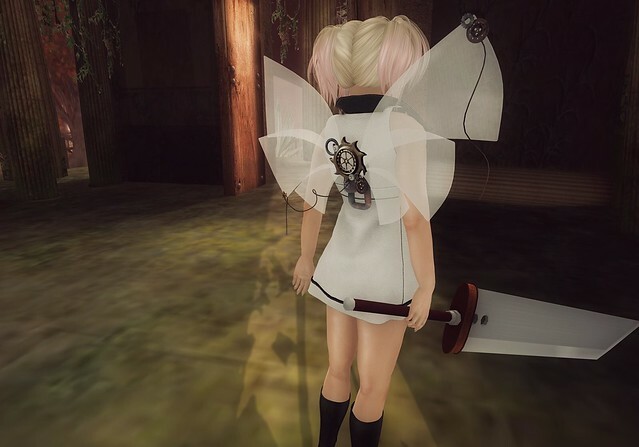 This awesome sword, and both poses featured in this post, is by HopScotch. I am so in love with this! It made dressing up as my own personal video game character really easy, and super fun! My top/skirt combo is by Kaithleen’s, and is actually for the Style Icon Fair, but it seems to match the theme so well. I am absolutely in love with these wings, by Tentacio. I love the way that steampunk items look, but I rarely find a good way to incorporate them into what I’m wearing. These are delicate and pretty, and I can just imagine a video game character with them. They can also be found at the Final Fantasy Festival!